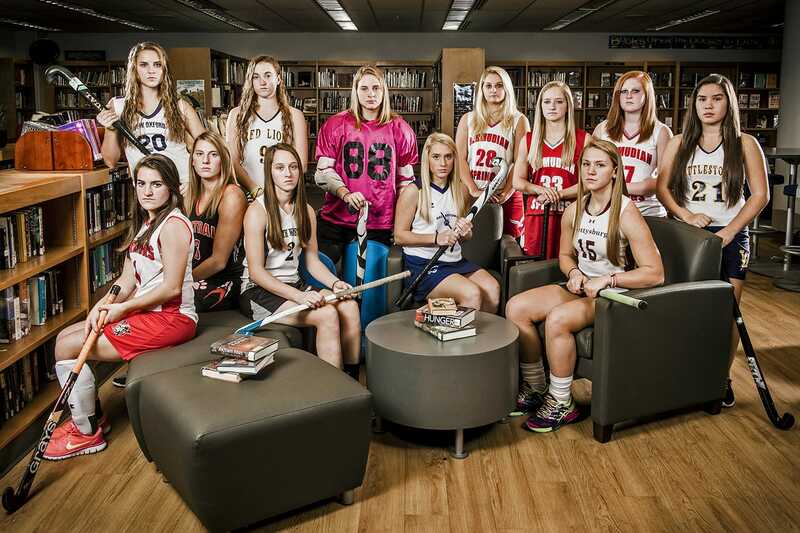 The top YAIAA field hockey players from 2015, as selected by the GameTimePA.com staff. Burk scored the winning goal in overtime of the Warriors’ first-round playoff game against Lancaster Mennonite, and played a key role in helping her team win 15 games this season. Dews, a team captain, moved from midfield to defense this season and immediately controlled the Thunderbolts’ backfield. She had seven defensive saves as she helped her team go 8-2 in YAIAA Division III. Kenzie Farley, Bermudian Springs, sr.
Farley scored 62 goals and had 14 assists while playing a big role with the Eagles, who advanced to the YAIAA championship game and won a district playoff game. She’s committed to play at Lock Haven next fall. Jayla Godfrey, Red Lion, sr. The Lions relied on Godfrey to get things going offensively all year, and the senior responded by scoring 11 goals and posting nine assists. She helped the Lions go 10-6-1 and qualify for the District 3 playoffs. Kaelyn Long, New Oxford, jr.
Long left many coaches shaking their head about how to compete with her in all facets of the game. She scored 22 goals and had 20 assists during the regular season, helping the Colonials advance to the YAIAA tournament for the first time. Miller scored 17 goals and delivered 18 assists for the Warriors, helping her team win a second straight YAIAA Division II title. She’s committed to play at Lock Haven next fall. Noll, a three-year starter, played center midfield for the YAIAA champion Wildcats. She posted 12 assists and came up with crucial goals in league playoff games against Gettysburg and Bermudian Springs. Greta Plappert, Central York, sr.
Plappert provided the offensive firepower for the Panthers, scoring 23 goals and posting 15 assists this season. Her team tied for second place in YAIAA Division III with a 11-3 division record. Spangler provided Gettysburg’s biggest scoring threat, sending 19 goals into the cage this season and posting nine assists. She’s committed to play at East Stroudsburg next fall. Longtime Wildcats coach Jeri Myers said Terroso is one of the best goalkeepers she’s ever coached. With her in goal, Dallastown produced 17 shutouts and allowed only seven goals all season. Montana Utz, South Western, sr.
Utz, a team captain, finished a four-year career in which she scored a Mustangs record 63 goals. She completes her career with five hat tricks and three four-goal games. Morgan Williams, Bermudian Springs, sr.
Williams anchored a Bermudian Springs defense that was a big reason that the Eagles won 18 games and advanced to the YAIAA championship game for the first time. She also scored four goals and had eight assists. Nicki Wolf, Bermudian Springs, jr.
Wolf provided the Eagles with an alternative scoring threat alongside Farley. She scored 16 goals, including a game-winner in overtime of a league playoff game against New Oxford, and had 18 assists this season. Bixler led his team through a difficult time when four players were involved in a car crash early in the season, and he steered his team to its ninth straight YAIAA Division III title. Bixler’s Eagles — without two players who never returned from injuries sustained in the crash — also won a YAIAA tournament game for the first time in school history and won a District 3 Class AA playoff game for the first time since 2010. New Oxford: Breanne Sauter. Bermudian Springs: Lindsey Brehm, Jenifer Jimenez. Hanover: Avery Martz. Gettysburg: Katelyn Gormley. Littlestown: Kelsie Dews. Spring Grove: Camille Lecrone. Dallastown: Molly Lohss. Dover: Alexis Kohr, Dover. Susquehannock: Kristy Langhans. Red Lion: Jackie Golden. The GameTimePA field hockey all-stars discuss numbers, superstitions and animals.